USPA NEWS - The ECB’s President Mario Draghi unveiled the new €20 banknote last week at the ECB’s headquarters in Frankfurt and announced that it would enter into circulation on 25 November 2015. The new note includes an innovative security feature in the form of a “portrait window” set in the hologram. USPA NEWS - Frankfurt Main [ENA] An interesting ECB PRESS RELEASE for people who want to see behind the curtain. 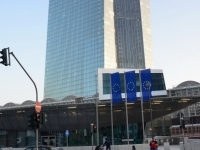 USPA NEWS - ECB Banking Supervision recommends prudent dividend policy and announces review of variable remuneration ● Banks should adopt a conservative policy when distributing dividends, taking into account the current challenging economic and financial conditions.